Davydov S.V. et al. Inoculants Market - Chaos or Development? Discussed is the effect of external, physical fields on metal melt with the purpose of changing the structure and properties of the alloy. The total internal energy of metal melt is represented as a sum of energies being imparted to the alloy. It is suggested that the energies being imparted to the alloy during melting, overheating, thermal-temporal treatment and action of physical fields should be evaluated through values of specific energy consumption. To compare the actions of external, physical fields on the mechanical properties of alloys, the coefficient of effectiveness of alloy treatment was used. Results of effect of thermal-temporal treatment on the action of electric energy during inoculation on the structure and mechanical properties of cast steel and gray iron are given. The results of experiments have shown the possibility of enhancing the mechanical properties of those alloys at an optimum thermal-temporal treatment of metal melt with subsequent action of physical field during inoculation. The present study examines the effect of heat treatment on the coefficient of linear expansion (CLE) of gray iron. Anomalous decrease in CLE in two temperature ranges of testing 100…200°C and 400…450°C has been revealed. The CLE reached values close to Invar alloys. It was supposed that the manifestation of anomalies is related to the change in the ratio of introduction elements in cast iron - hydrogen, nitrogen and oxygen, which indicates the necessity of working out new ideas of the metal expansion mechanisms. The Executed researches have shown, that experience of traditional application of the titan in small amounts with the purpose of strengthening allocation of graphite and crushing graphite of pig-iron by manufacture fine сastings, can not be used by manufacture large сastings. In large сastings from the сast iron containing ~ 3,5 % of carbon, owing to their slowed down cooling the titan in amount of 0,06 % causes the raised propensity to intensive allocation of graphite and as, investigation, results in deterioration of character of morphology of the graphitic phase, accompanying with falling of durability. Character of mastering of the titan in process swimming trunks from temperature liquid сast iron and distribution of silicon and manganese (factor heterogeneity) on section skeleton initial austenita is investigated. Was installed, what in process of melt ageing period characteristics micro- and macrostructure synthetic cast iron changed on dependence from extent melt non-equilibrium. Was given quantitative estimation these changes and was shown them conditionality with the help of mechanism structure formation of synthetic cast iron. Discussed is the mechanism of effect of excessive free energy on the structure forming process and self-organization of dissipative structures. It is shown that the accumulation of excessive free energy that controls the refinement of all structure elements and transition to nonequilibrium concentration of elements in the phases is able of ensuring the self-controllable synthesis of new structures. The excessive free energy plays the main role in the prognostic function of scientific search for a solution to the problems of creating materials with improved and new properties. An equipment and effective casting technology of directional solidification for production of cylinder sleeves for forced Diesel engines are described. The mechanical properties and power-economic characteristics of the cylinder sleeves are higher than of best analogues. Repeated application of self-return makes the tech-process closed and wasteless, which allows decreasing of primary charge material consumption and excluding energy expenses for heat treatment. Described is a new centrifugal casting system КЦЭШЛ-1 for the production of electroslag ring billets weighing up to 1,000 kg, with a diameter of up to 1,500 mm and a height of up to 1,000 mm. The possibility of using consumable and nonconsumable electrodes switched on by mono or bifilar schemes is provided for. Consumable electrodes in the rolled, cast, welded form from rejected and worn parts, as well as shear cuttings and metal chips can be used as materials to be remelted. Level of mechanical properties and structure-and-energy characteristics of spring steel after different heat treatment conditions and application of electrochemical coatings are assessed. The kinetics of isothermal transformation, morphology of products and their behavior during tempering are examined from new positions, practical conclusions are made. Described is a method of determining shrinkage of metals and alloys using the "Bolshakov" instrument allowing excluding the influence of linear expansion of the intermediate element interacting with the cylindrical specimen, which is especially important in the range of 900…1,000°C. Mathematical representation of dependencies facilitates their use in calculations when investigating the continuous casting process parameters. Makarov G.S. 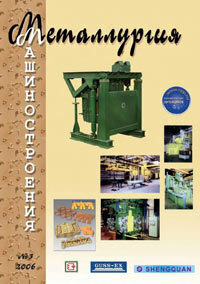 The 3rd International Conference and Exhibition "Aluminum Recycling"